Amun-Ra is the solar ram, the deity of the sun and its power and light. He is also the deity of creativity, breath, and fertility. I have sometimes referred to him as the Spirit of the Sun.I really like sunlight, the warmth, radiance, and heat associated with the sun, and the way it just makes everything brighter and more lush, especially the water and the sky. As the ram is the symbol of fertility in Egypt, he is Egypt’s fertility deity par excellence. I feel that as Ra he gains a great amount of power associated with the sun, not just its light, radiance, and life-giving power, but also its fire and wrathful power (embodied in the Eye of Ra). In spite of this, Amun-Ra’s main theme and domain is not particularly violent, and more associated with light and divinity in general. He has a special place on my list of deities for two reasons other than him being a sun deity (and I really like sunlight). The first reason being is that he’s the only deity I’ve inducted that actually has the head of an animal, which would grant him kind of unique status. The second reason is that the animal in question is a ram, and the ram happens to be my astrological sun sign, Aries, who is associated with Mars, spring, and the fire element. The thing is, I don’t usually care for astrology and what people say about astrological signs, I don’t at all read horoscopes, and I don’t like giving astrology too much credit because if you believe in astrology, then you believe that everything about you is determined or influenced by the stars, the planets, and their patterns, which to me means that you are not you because you are who are you but because it was ordained in some way, which I feel is a contemptible belief to hold. And I certainly don’t care for the memes they make about astrological signs or how people assume people are meant to act a certain way or follow a certain pattern because of their signs. But that’s not to say I don’t have any sort of respect for my sign, or that I didn’t find inspiration in it. I don’t believe that Aries is some sort of mould or expectation that should be followed carefully, and I don’t believe that being an Aries makes me anything like what Aries people are supposed to be, but I do find it inspiring at times, especially when I did the research about the ram’s connections. I became captivated with the idea that the ram represented the spirit of the sun deity in Egypt, and its connections with fertility (I also found out the ram was meant to be associated with both war and fertility, which is interesting and sensible enough), as well as its connections with the old Indian fire deity Agni. Because of this and Amun-Ra’s association with the solar deity and quite a few fertility deities, Amun-Ra is a loaded deity for me, and that makes him special. As you might expect, Amun-Ra was originally two distinct deities: Amun, the king of deities and a deity of the wind, and Ra, the sun deity. However, Amun-Ra’s attributes ultimately derive from a few more deities than just those two alone. Let’s begin with Amun. Amun originally belonged to a group of deities known as the Ogdoad, four pairs of primordial deities (each consisting of one male deity and one female counterpart of that deity) who were worshiped in the city of Khmun (known in Greek as Hermopolis). Each deity represented primordial powers or elements, and the male and female deities represented the male and female aspects of these powers. Amun and his consort Amaunet represented air and wind, Nun and Naunet represented the primordial waters, Kuk and Kauket represented darkness, and Huh and Hauhet represented eternity. Together they represented the original state of creation, from which the solar deity Ra would emerge. However, in the 11th dynasty, Amun eventually rose to become the patron deity of the city of Waset (aka Thebes), replacing the local war deity Montu, and his consort was now Mut instead of Amaunet, and he gained a son named Khonsu, a lunar deity. Eventually, under the pharaoh Ahmose I, Amun rose to the status of national deity of Egypt, while the city of Waset, who you will remember was the center of Amun’s cult, became the capital of Egypt itself. During this time, Ahmose’s army had expelled the Hyksos, a dynasty of foreign rulers, and it is partly because of this that Thebes became the capital city which led to Amun receiving national importance. Amun would come to be the most important deity during this period, except during the reign of Akhenaten, who introduced a short-lived monotheistic cult of a solar deity named Aten. Amun was seen as a deity of creative power, but was also considered a hidden deity, and during the New Kingdom he was especially believed to be a transcendental and self-created deity. Around this time, Amun also came seen as a protector of the downtrodden and the upholder of Ma’at (the Egyptian concept of order, truth, and cosmic law). His animal symbol was frequently the ram, a symbol of fertility. A ram-headed deity was also worshiped in Kush, and was identified with Amun. The ram’s association with fertility and with Amun led Amun to be seen as a fertility deity, causing him to be identified with Min, who was also a fertility deity. Eventually, Amun’s cult grew until it began to eclipse the cult of Ra, the solar deity who was also considered one of the most important deities of Egypt, and Amun became identified with Ra, resulting in the combined deity Amun-Ra. Amun-Ra was considered a solar deity, creation deity, and fertility deity in one, and a hymn to Amun-Ra also describes him as a “lord of truth, father of the gods, maker of men, creator of all animals, lord of things that are, creator of the staff of life”. Amun-Ra eventually became so prominent, that his cult was almost monotheistic in nature (as opposed to the Aten cult which was wholly monotheistic), and he was considered the father and protector of the pharaohs. His worship even spread outside Egypt, and was considered an important deity in the Nubian kingdom of Napata. The Greeks identified Amun himself with Zeus, and worshiped by them as Ammon, often as a horned deity named Zeus-Ammon. Even as the dominance of Amun/Amun-Ra declined, he was still continually worshiped in his old cult center at Waset, and was also seen as the national deity of Nubia. Now onto Ra, also known as Re. Being a solar deity, Ra was very important to the ancient Egyptians. The sun represented warmth, light, and life in general, and it was feared that if the sun stopped rising then it would mean eternal darkness and the end of the world. The pyramids and obelisks were often associated with the sun, and by extension with Ra, obelisks being viewed as petrified sun rays. His cult center was the city of Iunu (aka Heliopolis), which was considered to be the seat of Ra. On an interesting side-note, Egyptian and Greco-Roman legend describe the mythical phoenix as rising from the ashes of its predecessor, and then bringing said ashes to the altar of the solar deity in that same city. Iunu was also the cult centre of Atum, another deity associated with creation (much like Amun) and one of the older deities of Egypt, and the two were associated and sometimes identified with each other. The sun disk often served as his crown, but it was also associated with The Eye of Ra. The Eye of Ra was seen as the body of Ra, or an instrument of his wrathful power. The Eye of Ra was also associated with the lion-headed goddess Sekhmet, a violent goddess who was originally created by Ra to destroy humanity when he got tired of them, until he changed his mind of course. The goddesses Hathor and Bastet were also goddesses created by Ra and were viewed as instruments of his vengeance (in fact, Sekhmet was created to finish the job after Hathor), though Hathor usually has more benign connotations. Ra’s two main enemies were Apep, the serpent of annihilation that seeks to destroy the same, and Aset (more popularly known as Isis), mother of the deity Horus who frequently schemed against Ra and in favor of Horus because she wanted him to have all the power. A very well-known myth about Ra is the myth of his journey through the underworld. Every day, Ra would sail the underworld accompanied by other deities, and he would have to fight and defeat Apep. Usually Ra is victorious, but sometimes Apep was thought to be victorious (usually on solar eclipses). He is often depicted as protected by either Set or Horus, and is often depicted with a ram’s head when venturing into the underworld. The ram was considered to be the soul of the solar deity, and ram deities were sometimes considered appearances of other deities, possibly due to the Egyptian words for “ram” and “soul” sounding the same. Banebdjedet was considered to embody the four souls of the sun deity, as well as the souls of Osiris, Geb, Shu, and Atum (or Ra-Atum). The deity Heryshaf was identified with Ra and Osiris (as well as Dionysus and Heracles in Greece). Khnum himself, one of the oldest deities of Egypt, was also seen as an aspect of Ra. Perhaps it might be to do with the fact that Khnum’s cult was very popular before it was eclipsed by Ra’s cult. What’s interesting about Khnum is that he was associated with water, in fact he was associated with the Iteru river (better known as the Nile) and was the guardian of its source. In the year 30 BCE, Egypt was annexed into the Roman Empire became a province known as Aegypticus. After Rome declared Christianity as the state religion in 380 CE, the polytheistic cult(s) that were previously observed were deemed heretical and the deities that were previously worshiped for thousands of years were banned from being worshiped. Over time, some of the old deities of Egypt came to be viewed as demons just as many deities did, and in modern times some of well-known deities of Egyptian deities are sometimes the subject of Chrisitan conspiracy theories which mistakenly relate them to Satan or Lucifer. Amun would come to be translated as Aamon, a powerful demon associated with anger who is found in the Lesser Key of Solomon. In the Book of Invocation of the Demons Vercan, Maymon, Suth, Samax, Sarabotres, Mediac or Modiac & Arcan, a demon named Maymon appears to have been linked with Amun-Ra in the form of Maymon-Ra. 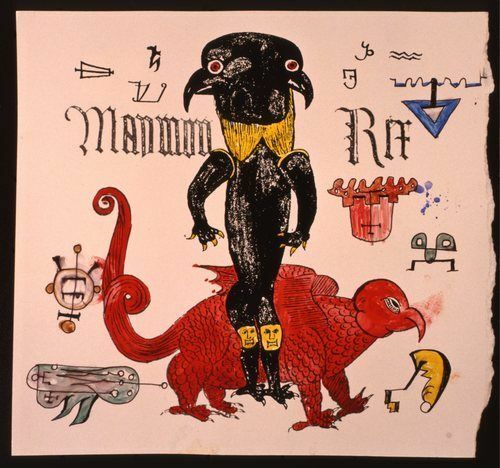 Maymon is usually identified with Mammon, and so Maymon-Ra is often identified as Mammon-Ra, who is also the subject of some conspiracy theories (including anti-Semitic conspiracy theories that accuse Qabbalistic Jews of worshiping Mammon-Ra). Some identify Maymon with Amaimon, a demon whose name is said to mean “terrible violence and vehemence” and the only demon said to be able to control Asmodeus, the demon of lust. Some say that Amon, Maymon, and Amaimon are names of the same demon.